Samsung SDS, an information and communications technology solutions company under South Korea’s Samsung Group, on Thursday hosted an inaugural developer’s conference to share its know-how in next-generation technologies including artificial intelligence and blockchain. In its first edition, “Techtonic 2018” brought together some 1,000 IT developers, college students and industry officials with master’s and doctorate degrees in IT development to discuss successful cases of business innovation using AI, analytics, blockchain, internet of things and security solutions. In a keynote speech, Samsung SDS Chief Technology Officer and head of R&D Yoon Shim highlighted SDS’ technology development road map and its continued push to secure cutting-edge technology development capabilities and global partnerships. At the center of the push is Brightics Studio, an open-source AI analytics platform developed by Samsung SDS. The platform enables developers to access data analytics capabilities including deep learning without the need for specified coding, according to the firm. Brightics Studio is available for free download on the Brightics AI website and Github. Samsung SDS plans to host another tech event, the Agile Korea Conference 2018, at its headquarters in Jamsil on Nov. 23. 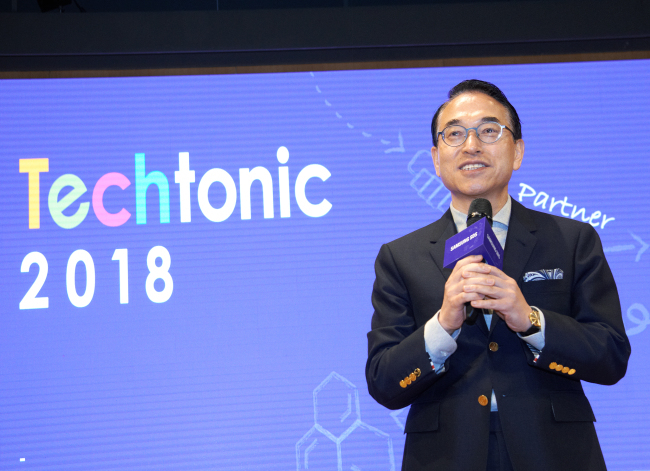 The firm also plans to host Techtonic 2018 as a regular event for the Korean developer’s community.